EXXON MOBIL HAS DOUBLED DOWN ON DIRTY TAR-SANDS OIL | "Global Possibilities"
The company recently admitted that it has invested heavily in Canada’s tar-sands oil reserves, InsideClimate News reports — and it was not a good bet. 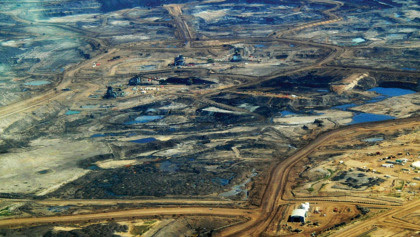 Tar-sands oil is difficult, expensive, and energy-consuming to extract, making it especially bad for the climate. It’s only profitable when oil prices are high. Exxon acknowledged in a public financial disclosure report this fall that it could be forced to take a loss on billions of barrels of tar-sands oil unless prices rise soon. The company made this unwise investment despite long knowing, as InsideClimate News previously reported, that burning oil causes climate change and future climate regulations could make tar-sands oil unprofitable or impossible to drill. In 1991, Exxon’s Canadian affiliate Imperial Oil commissioned an analysis that found carbon regulation could halt tar-sands production. “Yet Exxon, Imperial, and others poured billions of dollars into the tar sands while lobbying against government actions that would curtail development,” according to InsideClimate News. This news comes just after Donald Trump nominated ExxonMobil CEO Rex Tillerson to be secretary of state. The State Department is responsible for reviewing proposed pipeline projects that cross international borders, like Keystone XL, which would have carried tar-sands oil from Canada down toward U.S. refineries.